Boilsoft Video Cutter is a perfect video cutting software to cut video files into several segments easily and quickly. 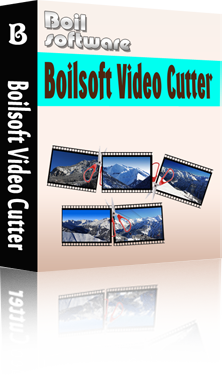 Boilsoft Video Cutter cuts all popular formats video: it works as an AVI video cutter, MPEG video cutter, VOB video cutter, WMV video cutter, ASF video cutter, RM video cutter, RMVB video cutter, 3GP video cutter and MP4 video cutter. Cut video faster and more efficient with its unique video cutting technique - without re-encoding process. Using Direct Stream Copy Technology, the target file's quality is the same with the source video file. AVI video cutter, DivX video cutter, XviD video cutter, MPEG video cutter, VOB video cutter, WMV video cutter, ASF video cutter, RM video cutter, RMVB video cutter, 3GP video cutter and MP4 video cutter all-in-one! Our Video Cutter has a faster processing speed than other similar products in the market. Using a unique technology, it only takes 1/3 time to cut a video compared with normal video cutters. File format will be retained after the cutting process, as well as the video quality. Select segments via the control bar or time-editing panel and one click to cut them all. Preview video with the built-in player to help you select segments conveniently and precisely. How to use Boilsoft Video Cutter?